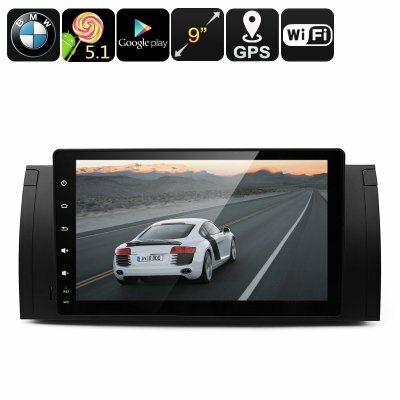 Successfully Added Two DIN Car Media Player For BMW 9-Inch HD Display, Android 8.0.1, Google Play, Quad-Core CPU, GPS, FM Radio, Bluetooth, Wi-Fi to your Shopping Cart. Pimp your ride and take the most out of your upcoming road trips with this beautiful 2-DIN 9-Inch car entertainment system that has been specifically designed to fit your BMW Series E39, M5, X5, E38, and E53. Featuring a large HD display that portraits all media in stunning detail and vivid color, this 9-Inch car media player allows your passengers to enjoy the latest movies and Android games in mesmerizing resolution. Along with its Android 8.0.1 operating system, this car media player comes with plenty of features and entertainment possibilities. Simply head out to the Google Play Store and you’ll be able to download the latest movies, games, applications and more – sure to keep your passengers entertained throughout your upcoming road trips and holidays. Thanks to its plug and play design, this two DIN car media player can be easily installed inside your beloved BMW. With its Quad-Core CPU that has been clocked at 1.2GHz, this Android car media system is capable of handling the latest mobile games, applications, and movies alike without dropping a frame. Packing 16GB of internal storage and providing the possibility to add in an additional 32GB of external storage through a TF card, this Dual DIN Car Android media player is sure to provide enough space for you to store all your favorite media and games alike – assuring that your passengers never have to be bored again while waiting to reach your upcoming destination. Additionally, this Android car media player also features a USB port through which you can easily insert all your favorite media into your entertainment system. Thanks to its adjustable brightness, the 9-Inch HD display of this beautiful two DIN car media player is capable of providing you with clear and sharp images at any time, even whilst in direct sunlight – assuring that your passengers will always be able to enjoy a stunning media entertainment. Besides being the perfect car media hub, this 2-DIN DVD player for BMW also features a highly accurate GPS navigation system that helps you find the fastest way to your upcoming destinations and assures that you’ll never get lost on the way again. No matter where on the globe you’re located, this GPS system will provide you with accurate traffic information and highly detailed 3D maps whenever requested. When not used for its GPS nor gaming and movie playing capabilities, this Android Car media player additionally is able to function as a regular FM radio, letting you enjoy your favorite songs, talk shows, and the news at any given moment. Featuring Bluetooth connectivity, this 2 DIN Android 8.0.1 car entertainment system allows itself to be paired with your smartphone and other Bluetooth enabled devices – letting you synchronize your media player with your music library, movies, and contacts. With its built-in microphone and speaker, it additionally allows you to engage in hands-free phone calls – ensuring your safety on the go. Whether you use it to entertain your passengers with the latest movies and games, to listen to your favorite tracks on the radio, or to find the fastest way to your next destination through its highly accurate GPS system – this car entertainment system is the perfect media player out there that is sure to meet all your demands. This 2 DIN Android car media player comes with a 12 months warranty, brought to you by the leader in electronic devices as well as wholesale electronic gadgets..
Support Bluetooth MP3 player function (Attention: This function can only be realized when the mobile phone supports Bluetooth Audio Output). Support Bluetooth Phone Book Function. You can quickly search for contacts manually, and it supports displaying caller name. Video: MPEG-1/2/4, H264, RMVB, DivX …all Android videos, network media playing, 1080P video decoding. Audio:MP3,WMA,WAV,AC3,OGG,FLAC, and network audio playing. Arabic: - سيارة الروبوت ميديا بلاير - Chinese Simplified: - 安卓汽车媒体播放器 - Czech: - Android Auto Media Player - Dutch: - De speler van de Media van de Android auto - French: - Lecteur multimédia Android voiture - German: - Android Auto-Media-Player - Hebrew: - המכונית אנדרואיד Media Player - Hindi: - एंड्रॉयड कार मीडिया प्लेयर - Hungarian: - Android autó Media Player - Italian: - Lettore multimediale Android auto - Japanese: - Android の車メディア プレーヤー - Korean: - 안 드 로이드 자동차 미디어 플레이어 - Malay: - Kereta Android Media Player - Norwegian Bokmål: - Android bilen medieavspiller - Romanian: - Android auto Media Player - Russian: - Андроид автомобильный медиа-плеер - Spanish: - Reproductor de medios Android - Thai: - รถหุ่นยนต์เล่น - Turkish: - Android araba kitle iletişim araçları oyuncu - Vietnamese: - Android xe Media Player.